The Cassini-Huygens mission has provided an incredible diversity and wealth of information about Titan. This claim is supported by this sizable book that encompasses all the scientific results of the Cassini-Huygens mission with regards to Titan. The immensity of new data and the complexity of this fascinating moon has entitled Titan to its own volume, and the results concerning Saturn and its other moons are contained within a single volume entitled Saturn from Cassini-Huygens . This book aims to encompass the enormity of scientific research that has utilized data accumulated from the Cassini-Huygens mission. 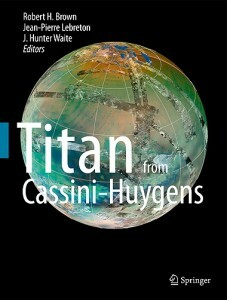 The authors uphold this intent by structuring the book to flow from the pre-mission knowledge of Titan through to chapters ordered around recent discoveries due to the Cassini-Huygens mission, such as data about Titan’s origin, structure, geology, atmosphere, ionosphere, seasonal changes and astrobiology. Much of the book is dedicated to explaining an array of noteworthy chemistries that are going on within the atmosphere, and to a lesser extent, the surface and interior of Titan. Many of the chemistries that have been the focus of study are processes that form hydrocarbons and nitriles. The book ends by proposing unanswered and newly fashioned questions that future missions to Titan could answer. This book could be used in a variety of ways as the overview at the beginning of the book describes the main results for Titan that are then fully explained in later chapters. The overview manages to weave all the areas of Titanian scientific study into one complete picture that is not only evocative but also facilitates the effortless transition into the focused chapters. This means that those who are only interested in a certain aspect of Titan can read through the short overview and pick out with ease those sections that they would like to continue with, using it as a text book. However, the book also has an excellent flow and is written in ‘plain’ English with many colour illustrations, and so can be read straight through as though it was a scientific novel, telling the story of Titan from those that are the most intimate with this captivating moon. Also, the companying CD includes a magical composite video of the Huygens landing, which includes many elements of data from Huygens into one single beautiful video and is riveting enough that it can be watched numerous times without any reduction in interest. When considering this book as being appropriate for ASB members it needs to be noted that the astrobiological importance of a large degree of the research is not generally pointed out throughout the book. Instead the astrobiological significance has been collated into one chapter, which is concerned more with the relationship of chemistries going on within Titan that can be somewhat paralleled to conceivable processes that took place on the pre-biotic Earth – rather than research into the habitability or types of life that could inhabit Titan. This parallels the types of astrobiological research that has been done to date and opinions of many of those studying Titan who dismiss the surface as inhabitable and shrug their shoulders in disinterest at the importance of the subsurface ocean for astrobiological potential. This runs deep into the chapter which, rather than all the chapter authors writing in cohesion, has been split into sections each having been written by a single author. Each author has their own opinions on the issue of habitability and consequently discusses different aspects of astrobiology on Titan. This produces a well-rounded view of the issues of astrobiology on Titan. However, it doesn’t go into too much detail on the possible forms of exotic biota living in hydrocarbon lakes on the surface and only comments on the possibility of life in the subsurface ocean. Also missing from the chapters ‘Titan’s Astrobiology’ and ‘Titan Beyond Cassini-Huygens’ are any discussions of future missions involving any kind of active search for extant biota. This could come in the form of looking for actual living biota within the hydrocarbon lakes on the surface, or searching the cryovolcanic sites for remains of biota that once lived in the subsurface ocean and have subsequently been dragged to the surface in icy flows, or maybe even sending probes that could melt their way to the subsurface ocean like those proposed for Europa. Once again, this lack of discussion reflects the discussions of this nature within the Titan community at large, which is to say that it is oddly absent. In conclusion, this book should be on the shelf of any Titan enthusiast who is looking for a book that brings together the majority of knowledge about Titan to date. However, in terms of the astrobiological potential of Titan it lacks some theoretical suggestions for exotic biota, and thoughts into future missions based on astrobiological concerns. I would recommend to those ASB members that are only interested in the astrobiological aspects of Titan to read the single condensed chapter focusing on this issue – unless they wish to learn about the whole Titan environment in order to come up with their own theories or experimental research into the habitability of Titan. Saturn from Cassini-Huygens (2009) Dougherty, Michele; Esposito, Larry; Krimigis, Stamatios (Eds.) Springer. ISBN: 978-1-4020-9216-9.